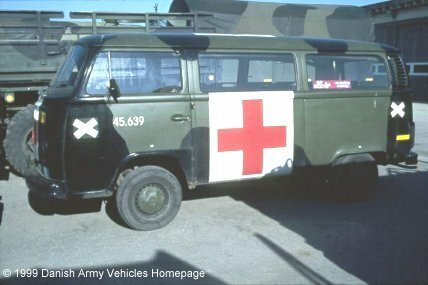 Danish Army Specific: The VW M231 saw widespread service in the army in the 1970´s. Historical: As for the T2 M221. Length: 4.50 m (175 inches). Width: 1.72 m (67 inches). Height: 2.12 m (82 inches). Weight: 2.300 kg (5.060 lb.). Engine: Own 4-cylinder, 1584 cm3 (97 cubic inches), air-cooled. Horsepower: 50 at 4.000 rpm. Fuel capacity: 57 liter (12 gallons). Additional: Shown vehicle is probably a middle 1970´s vehicle. Acquisition price in 1975 was around 35.000,- DKr.